Elite Primary Care accepts most major insurance plans including BCBS (all networks except “E”), Cigna, Humana, Medicare, TN Medicaid, and UnitedHealthcare. Dr. Pike is limited to the number of patients on his panel to ensure the best possible care. Therefore we have to limit new patients to our clinic. We are no longer accepting NEW Tricare patients and some other insurance plans. 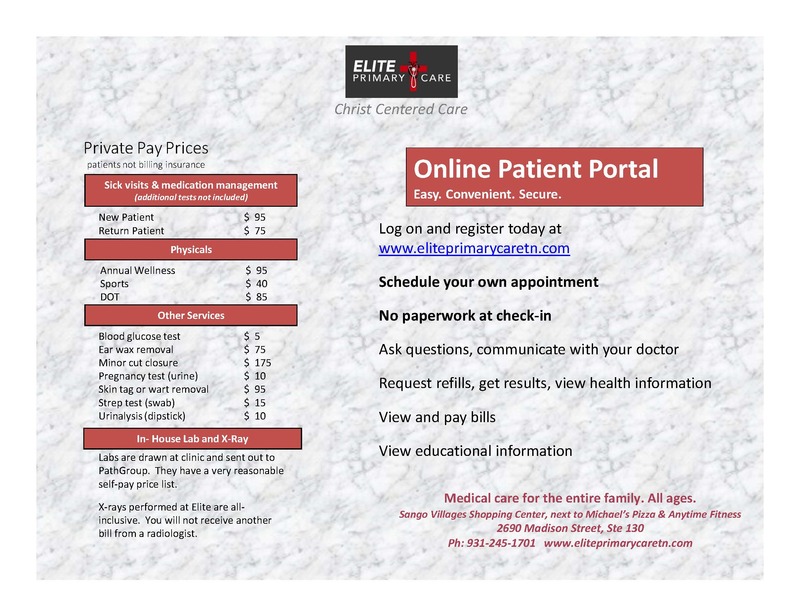 Elite is out-of-network for Aetna, HealthSpring, and AmeriGroup. Our mission is to deliver the finest, most cost effective health care treatment available. Following your diagnosis, we will advise you of their plan for treatment. Additionally, we will discuss with you the cost of today’s and future treatments. Payment for today’s visit and your future visits are due a the time of treatment. We are sensitive to the fact that some patients may not be able to pay cash for their treatment. Therefore, we do offer several alternative payment programs for your convenience.